Preschool and Kindergarten Kids Educational Early Learning Adventure Games. Teach Me Counting, Colors, Alphabet, Math, Numbers, Geometry, Shapes Sorting, Patterns, Puzzles, Learn to Read Letters for Toddler Children. The one and only educational application about bees and pollinators. Entertains and teaches children how significant and essential for the ecosystem honeybees and other pollinators are. Cute little meerkats Tishi, Tashi and Ubaki decided to hide. Can you find all of the hidden Meerkats? Can you catch all brothers, sisters and the treasures hidden somewhere in 12 beautiful worlds? A jigsaw like puzzle game which helps your kindergarteners and preschoolers develop fine motor skills, matching, tactile while playing 62 different animals, toys and vehicles. Beautiful and simple music application for the littles ones, which inspires and encourages kids to create own music. Great introduction for toddlers and preschoolers to explore the world of music. 123 Kids Fun ALPHABET is fun, captivating and interactive way for your children to learn and practice saying, identifying and writing the letters of the alphabet. 123 Kids Fun MUSIC lets your toddlers and preschoolers explore the fun filled world of musical instruments! This simple and intuitive app has 25 different instruments to explore and have fun with including:an interactive Xylophone, Drums, Guitars, Trumpets, Flutes, bells, and many many more! 123 Kids Fun Animated Puzzle is a collection of delightful puzzles which help toddlers and children learn the names, noises and sounds of over sixty different animals and objects as well as help them develop their memory, pronunciation, tactile and fine motor skills. Thanks to our app your child will discover step by step the world of sounds that correspond to characters and items. Younger kids will be overjoyed discovering hidden animals, insects and vehicles. Older kids can try to guess what hides behind the sounds, then learn the name of each animal, insect and vehicle which will help them with their letter recognition skills. 123 Kids Fun Paper Puzzle is a collection of puzzle games comprising of 6 categories containing 60 pictures in total. It is perfect for toddlers and preschoolers alike (ages 3 – 6). Because of its simple navigation and interaction system, 123 Kids Fun Paper Puzzle is very friendly for children to use. A music and sound application for children ages 1 to 3 years old. Welcome to a unique world full of sights, sounds and animations. This kids piano app will provide fun and entertainment for your toddler. Babies will enjoy tapping the different colorful keys on keyboard and listen to the animal sound effects. Kids can also learn to play three popular songs. Flashcards with great sounds and animations in many categories: Furniture, Insects, Fruits, Vehicles, Cutlery and Dishes, Clothes, Vegetables, Animals, Bathroom. It’s an adorable App for children to learn basic English words. 123 Kids Fun NUMBERS is an educational, fun and rewarding suite of games aimed at teaching your child to identify, say and form numbers. Hours upon hours educational fun with tons of bright and colorful illustrations and sounds, rich and immersing games and a reward system that keeps kids coming back for more! 123 Kids Fun Education is a collection of 15 educational and entertainment games designed for the younger members of the family. This app includes puzzles which teach children to recognizing colors, guess animal sounds, count and burst colored soap bubbles and much more. 123 Kids Fun Dots is an incredibly charming connect-the-dots game which helps toddlers and children learn the names of dozen of objects, colors, insects and animals. The gameplay is simple; connect the dots to reveal the hidden name and picture. 123 Kids Fun MONTESSORI PUZZLE is an educational arts and crafts puzzle app which will inspire children of all ages to create pictures, toys and dioramas from common things that can be found during the autumn/fall. The most entertaining of all Christmas games. 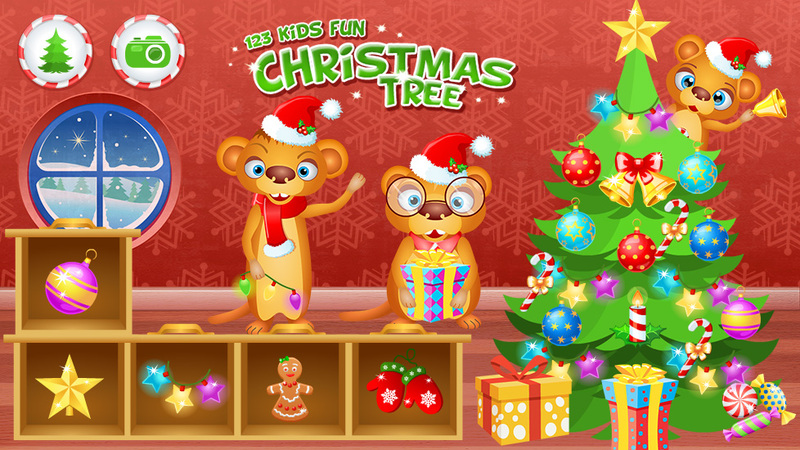 123 kids fun Christmas tree game is just the app your kid needs to playfully learn and sharpen their brain. It is one of the best free educational games for toddlers and preschool kids. It makes use of Christmas party games to your kids to sharpen their skills by involving them in fun activities. Families have fun during Christmas. You might have over the years enjoyed playing games. Spending time playing with your family by immersing yourself in the festival spirit. 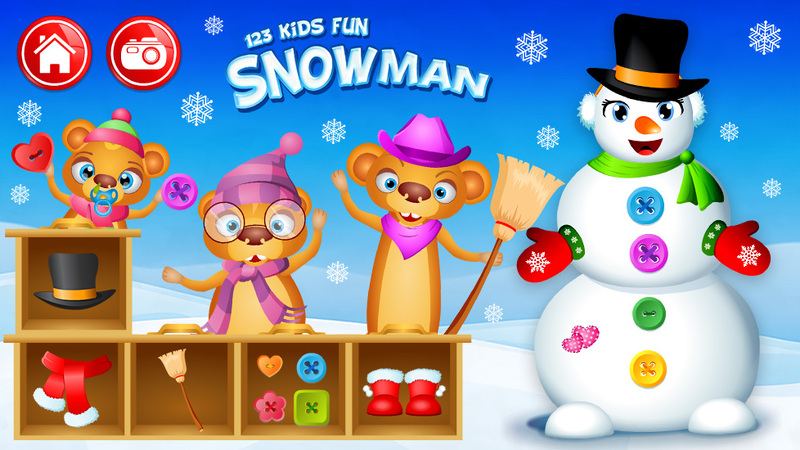 Making a snowman with beautiful white snow has been one among the several popular Christmas games. 123 Kids Fun Puzzle Blue is a collection of digital slider puzzles which help children identify a dizzying amount of animals and objects. Each slider puzzle has 3 different levels of difficulty – 6, 9, or 12 pieces. Our app covers 7 categories of vocabulary: The Zoo, Farm Animals, Vehicles, Characters, The House, Musical instruments, The Forest. 123 Fun Kids Puzzle Green is a collection of digital slider puzzles which help children identify a dizzying amount of animals and objects. Each slider puzzle has 3 different levels of difficulty – 6, 9, or 12 pieces. Our app covers 7 categories of vocabulary: The Alphabet, Birds, Toys, Dogs and Cats, Numbers, Shapes, Togr and Mila. 123 Fun Kids Puzzle Red is a collection of digital slider puzzles which help children identify a dizzying amount of animals and objects. Each slider puzzle has 3 different levels of difficulty – 6, 9, or 12 pieces.Our app covers 7 categories of vocabulary: Dinosaurs, At Home, Robots, Monsters, Aliens, Buildings, Sea animals. 123 Fun Kids Puzzle Gold is a collection of digital slider puzzles which help children identify a dizzying amount of animals and objects. Each slider puzzle has 3 different levels of difficulty – 6, 9, or 12 pieces. Our app covers 7 categories of vocabulary: Fish, Cuddly animals, Vegetables, Insects, Fruits, Sweets, Food. The Football Party in France is just around the corner. However, you can experience the football emotions already today. The Tashi Cup is within reach. 123 Kids Fun ANIMAL BAND is a unique application that allows you to assemble your very own animal band and make adorably quirky songs. You will have hours of fun creating and recording your own songs to keep and share with your friends. Create an amazing autumn themed world with 123 Kids Fun Montessori Craft. We have collected tons of autumn treasures for you to create countless characters, animals and objects. It’s fun to be an artist! Suprise your kid! Use this app for creating amazing and unique pictures using bugs, flowers, shells and many more summer items. Make beautiful summer themed world with 123 Kids Fun Montessori Summer. We have collected tons of summer treasures for you to create characters, animals and objects. 123 Kids Fun Montessori Summer will provide many hours of extremely creative fun. Simple memo game for toddlers and preschoolers, with dinosaurs, sea animals and aliens. There are 20 cards on the screen. Discover two cards and try to memorize pictures that appear.